The Arunachal Pradesh Congress Committee (APCC) has strongly condemned the recent statement made by Chief Minister Pema Khandu in which he reportedly threatened to impose “President’s Rule” in the State to allegedly suppress the movement of the state government employees led by Confederation of Service Association of Arunachal Pradesh (CoSAAP). Khandu reportedly made the statement in a public meeting at Jamiri under West Kameng district. 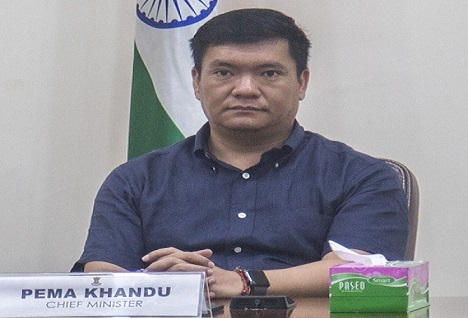 “By making such statements, Khandu is abusing the rights of the working class for his radicalized political gain. The APCC, however, is not surprised when Khandu warns of imposing President Rule because he himself became the chief minister without a public mandate and his government was destined to fail in terms of upholding people’s interest,” Congress spokesperson Mina Toko said in a statement. The Congress further said that Chief Minister Khandu, who has time and again reiterated to enforce Central Civil Service (CCS) rules on the agitators must also know that implementing the 7th Pay Commission in toto is also part of CCS. Besides demanding the 7th CPC allowances in toto, the other demands of the CoSAAP include immediate restoration of All India Medical Attendance Rule, NOC system to be implemented to all the citizens rather than making it limited to state government employees or withdraw the system completely etc. Meanwhile, realizing the hardships faced by general public, business community and other stakeholders due to long holidays and likely to face it further, the CoSAAP has decided to modify the modus operandi of its 2nd phase of democratic non-cooperation movement scheduled for October 23 to 26. All the employees shall attend office/workplaces and discharge their normal duties by wearing black badges as a sign of protest on October 23 and 24. The HoDs shall direct the employees to arrange black badges and wear. If the state government fails to redress the grievances till such period, the employees will resume its pen/tools down movement as announced earlier on October 25 and 26 next and the proposed third phase of democratic movement will stand as it was, a release from the association said on Sunday.